Working in the production of high-quality sheet metal construction since 1906, the company Jünger specialises since 1975 in container heads made of stainless steel, Hastellooy™, aluminium, special steels and copper with diameter up to 4300 mm. We supply to different business sectors having highest requirements: Food industry, chemical industry, furnace construction, vehicle construction, apparatus building, etc. We convince our customers with our extensive experience in batch production of special shapes or in extraordinary dimensions. Our series production is characterised by precision in mm range. For adherence to schedules, we guarantee flexible material procurement as well as prompt deliveries through our contractual partners in the shipping sector. 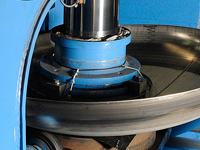 If there is a problem, we quickly provide flexible solutions with spare or repaired heads.